Which branch of the military saves the most? The Navy. And the least? The Army. The Washington Post reports on the “success” of the six-year old Thrift Savings Plan for soldiers. Although only about 36 percent of active-duty military personnel have enrolled in the tax-deferred contribution plan, which means there is plenty of room for improvement. As of April, 52 percent of Navy active-duty personnel were making contributions, along with 35.7 percent of the Marine Corps, 33.8 percent of the Air Force and 26.4 percent of the Army. Now a new paper in the Journal of Personality and Social Psychology claims that increasing the choice set saps people’s brainpower and energy more quickly. Researchers asked mall visitors to make choices about consumer goods, college courses, or class materials. The scientists then asked each group to participate in one of two unpleasant tasks. Some were told to finish a healthy but ill-tasting drink (akin to taking ones medicine). Other participants were told to put their hands in ice water. The tasks were designed to test how the previous act of choosing, or not choosing, affected peoples’ ability to stay on task and maintain behaviors aimed at reaching a goal. Researchers found that the participants who earlier had made choices had more trouble staying focused and finishing the disagreeable but goal-focused tasks compared to the participants who initially did not have to make choices. Serious and nuanced thinking about the political complications arising from tensions between individual freedoms and mutual obligations, and about the government’s role in modern life have been percolating across the Atlantic in the United Kingdom. Duncan O’Leary, a researcher at the think tank Demos, has just produced a short pamphlet, “The Politics of Public Behaviour,” summarizing some of the main currents about public policy responses to the blurring of public and private lives. Solomon Asch’s conformity experiments in which individuals gave obviously incorrect answers – such as pointing out which of three lines was the longest – about about one-third of the time simply because other members of a group also answered incorrectly. Between 2000 and 2006, U.S. hybrid sales increased from 3,000 to 250,000 vehicles. Why? The rise in gas prices? Government incentives like income tax credits and deductions, state sales tax waivers, single-passenger access to HOV lanes, and waivers of fees for registration, emissions testing, excise and parking? Or changing consumer tastes and preferences for a clean environment and an energy security policy? Rodney Overcash, the Director of Research at Marquette Associates, sends along a solution for Microsoft Outlook users who have a problem forgetting to attach documents. Overcash says he got “tired of falling victim to this embarrassment,” and developed this remedy. To calibrate the AutoCorrect settings, in the main Outlook Window, click Tools, then Options. In the new window, click the Spelling Tab, then AutoCorrect Options. In the AutoCorrect window, type “attached” in the Replace field and “attachedd” in the With field, then click Add. Repeat procedure for any word you might use when attaching a document. You may need to close Outlook and reopen for changes to take effect. Now, if I click Send and haven’t attached the document, the Spell Checker observes my misspelling and I can fortunately cancel the delivery of the email and add the attachment. If I remembered to attach the document, I simply hit “OK” on the suggested correct spelling from the Spell Checker, the respective word spelling is modified, and the message is immediately delivered. I can’t tell you how many times this has proven useful and I hope this suggestion might help. Or you could just watch Gene Hackman tell this story about loaning money to Dustin Hoffman. 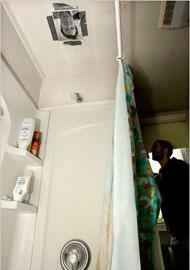 A group of Oberlin college students have posted a picture on John Edwards on their shower ceiling to help them shorten the length of their showers — saving water and energy. The shower’s energy-saving motivational accessories include a picture of former Senator John Edwards of North Carolina plastered to the ceiling. That was Ms. Bob-Waksberg’s idea. No one wants to linger in the shower with someone staring down from the ceiling, she said. “You could also look at it another way,” she said, “that John Edwards is encouraging me to take a shorter shower.” Why Mr. Edwards? “He had the strongest global warming policies of any of the candidates,” Mr. Brown said.